Hello! My name is Spot, and I am adorable, playful, and love to be scratched and petted! We have had Spot since he was a puppy. He was bred by my husband’s mother, and came to live with us after he was weaned. He’s been our family’s dog for the past 8 years and we love him dearly. Unfortunately he is having trouble adjusting to our toddler’s not-always-gentle ways, and that situation has been getting progressively worse. He needs a home without small children, and a family that has the time to give him the attention and regular exercise that he very much needs. Since having children, we cannot give him all that he deserves and this makes us all sad! I am very affectionate!!! I really like to be with my family as much as possible. If you’re doing laundry, I will follow you and watch you. If you are going to the bathroom and don’t want company, you had better make sure the door is latched, as I’ve been known to push the door open with my nose so that I can be with you there too! I love to be scratched on my hindquarters, and sometimes, when I roll onto my back, a belly rub is very welcome. I start asking to be let out of the crate I sleep in as soon as I hear my family members are out of their beds. I like to sleep in front of a woodstove, if you have one, but would also love to curl up on your lap with you as you read or watch TV! I love being petted and scratched, and will crawl into your lap whenever I notice it is free. I am playful! I love to chase after my nylabones and my stuffed toys (I have a stuffed ball that I love), but don’t necessarily bring them back to you and drop them! I can be a tease! I also like playing with other dogs, and play well with smaller dogs (like Beagles) and bigger dogs (like Australian Shepherds)! I’ve never had a problem with any dog I’ve met! I’m also a smart little guy! I know a few commands, such as “Sit”, “Stay”, “Wait”, and “Down” (Lay down). Because my family doesn’t like me to be on the living room furniture, I also hear “Off” a lot. I don’t always listen to that one the first time I hear it, but I do get down once I realize they’re serious. I can sing! I don’t howl on my own, but if my human family members start a “howl” session, I will join in! It’s adorable (I am told) and super fun to be part of a family group howl! I respond very well to positive training strategies (like treats!) but not so well to coercion and force. For instance, if you make me get into my crate and then close the crate door on me (which I don’t like), I might growl and air snap (I never hurt anyone! ), BUT if you toss treats in and make it a positive thing, I am much more amenable! That goes with many things, so I encourage you to use positive training techniques with me and we’ll both be much happier! I am mostly housebroken, though do have an occasional accident, and since I have not been getting daily walks (due to how busy my family is), sometimes I chew on stuff in the house. These are all things that are very likely to resolve with some normal daily exercise, a little positive training, and a bit more attention than my current family can provide. I love people!! I love my family best of all (of course!) but I also love meeting and greeting new people! I am very welcoming when strangers or friends come to the house, or if I meet them outside! I love making doggie friends, and like to play! I have never been to a dog park but I bet I would love it! I like to play with small and bigger dogs! As long as they are nice! I live with two cats right now, that have been here since they were kittens, about 4 years now. We get along pretty well. Sometimes they share my bed in front of the woodstove, which I hear is very sweet. I occasionally have to let them know they are annoying me with a little growl, but we’ve never fought or had any real problems. I don’t like babies laying on me and playing too rough with me (well really…what dog does), but am fine around gentle older kids who know how to behave properly around dogs! Howling along with a human (so fun!)! Chasing a ball or my bone! We have a toddler who shows her love for me in a way that makes me very nervous. I growl at her to tell her I don’t like what she is doing, and that makes my family nervous. Once, I nipped at her face, and my family realized that I need a home where there are only older kids and adults who know how to be with dogs. Also, I really need regular exercise, and my family is too busy to provide it for me. I have a serious flea allergy, I am allergic to the saliva of fleas, and if I am bit just once, it causes a ton of itching that I scratch at obsessively until I have red, sore, bruised looking bald patches on my hindquarters! Not good! 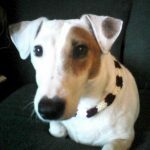 Luckily my family had good luck with Seresto flea collars, so as long as you keep one of those on me, things are good! Spot is an awesome dog that will shine fully with some more attention, exercise, and a home without small children that stress him out! He might really enjoy living in a home with another dog, but could also be fine as an only dog if he had lots of human interaction and got to play with other dogs (or go to the dogpark, or go to doggy daycare) sometimes! 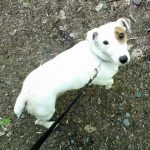 good with cats, good with dogs, good with mature kids, Jack Russell Terrier, male, neutered, small. Bookmark.